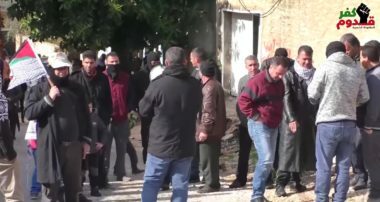 Israeli soldiers injured, Friday, several protesters during the weekly procession against the illegal Annexation Wall and colonies in Kufur Qaddoum town, east of the northern West Bank city of Qalqilia. Morad Eshteiwi, the media coordinator of the Popular Committee against the Wall and Colonies in Kufur Qaddoum, said the protesters nonviolently marched from the center of the village carrying Palestinian flags and chanting for liberation and independence. 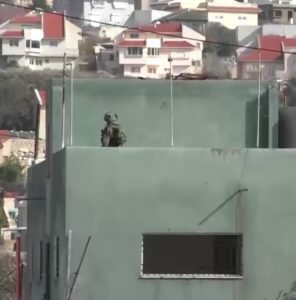 He added that the soldiers invaded Kufur Qaddoum and resorted to the excessive use of force against the protesters, by firing live rounds, rubber-coated steel bullets and gas bombs, while some protesters hurled stones at the invading forces. Several protesters, including international peace activists, suffered the effects of teargas inhalation, and received the needed treatment. Eshteiwi called on various international legal and human rights groups to intervene, and end the ongoing Israeli violations, occupation and oppression against the Palestinians and their lands, especially the army’s escalating use of excessive force, including the firing of live rounds at nonviolent protesters. He called on media outlets to expose these violations, and the ongoing oppression of the Palestinian people.